are based on the control units of common DJ CD players and are therefore equipped with jog wheels, play, pause and cue buttons as well as pitch controls. In addition to the fixed control elements, freely assignable elements are included. 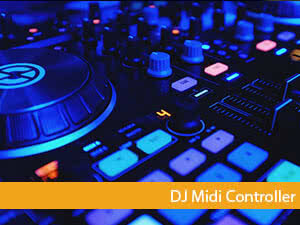 Special DJ controllers without audio interface are pure controllers that exclusively control the software and only influence the volume via fader controllers. These models contrast with DJ controllers with audio interface that can be used as stand-alone mixing consoles. 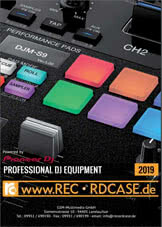 for DJs are not intended for DJing, but can still be used with Traktor Scratch, Serato Scratch Live or similar software. Selecting cue points, activating loops or playing samples may require the use of additional controllers. DJ software like Ableton Live makes external MIDI controllers a fully functional live instrument. Each software works with a controller adapted to it. MIDI messages that were originally assigned pitches, for example, specify loop lengths in some DJ controllers. Controllers that are not explicitly suitable for DJs have established themselves in interaction with certain software solutions. If you use external controllers, you work with Firewire or USB interface instead of the original five-pin MIDI standard interface. Each controller has a suitable driver for the connected operating system. Using the MIDI setup of individual software variants, DJs can usually freely assign individual parameters to various control elements. To put it bluntly. The segment is clearly dominated by Pioneer. Whether in the Pioneer DDJ or in the Pioneer XDJ series. Anyone who wants to publish electronically will find the right model in the Pioneer portfolio. However, there are alternatives - even good ones. Denon, for example, is a manufacturer that supplies high-quality controllers. Native Instruments also offers its own microcosm for tractors, which scores with well thought-out features and constant new innovations. MIDI controllers have different controller elements. Not every element and ultimately not every MIDI controller is suitable for controlling individual parameters. Knobs are designed to control rather constant parameters without the need for high precision. Ideal for effect parameters. Encoder knobs are ideal for selecting files, for example for song or effect selection. Faders are suitable for parameters with high regulation precision, such as volume or pitch shifter, and are mainly used in daw controllers to operate the software more precisely. Pads without touch dynamics are suitable for all parameters with two states (on and off), e.g. for on/off control of effects. Pads with touch dynamics, on the other hand, are suitable for all parameters that depend on a velocity value in addition to on/off information. Ideal for synthesizer sounds. Pad controllers are particularly popular in hip-hop and electronic applications. Touchpads usually control three different parameters at the same time and are suitable for filter and synthesizer parameters. Ribbon controllers are different from other MIDI controllers and include a control unit and a control box. The position and pressure sensor in the control unit operates without graduation. The information from the sensors only becomes control data and MIDI messages within the control box. Controllers of this type often control synthesizers, but in principle they can also be assigned effect and filter parameters. Also distinguishable from other MIDI controllers are infrared controllers, which correspond to optical control units and can be controlled by hand movements. Their stepless operation makes them suitable for pitch shifter and filter or effect parameters.